Republicans are poised to take over the FCC and dismantle consumer protections. Senate Republicans wrapped up business over the weekend without reconfirming a key Federal Communications Commission official, laying the groundwork for a wholesale rollback of important consumer protections under a Trump presidency. By failing to reconfirm FCC Commissioner Jessica Rosenworcel, despite earlier pledges to do so, Senate Republicans effectively removed one Democratic commissioner from the five-member agency. With FCC Chairman Tom Wheeler expected to step down in January, Republicans are poised to hold a 2-1 majority at the agency, giving them the opportunity to pursue what is likely to be an industry-friendly, deregulatory agenda. The first major item on the Republican chopping block is likely to be the FCC's landmark open internet policy protecting net neutrality, the principle that all internet content should be equally accessible to consumers. President-elect Trump's FCC advisory team are staunch opponents of net neutrality, and the agency's two Republican commissioners have made no secret of their desire to dismantle the FCC's net neutrality protections. Since her initial confirmation to the FCC in 2012, Rosenworcel, a 45-year-old former Senate staffer, has developed a reputation as a whip-smart and passionate regulator with a deep concern for addressing the "digital divide," especially for children. Her signature issue has been what she calls the "homework gap," which refers to the lack of affordable internet access for low-income kids in underserved and rural communities. "The Senate's failure to vote on her reconfirmation represents a stunning loss for the public interest." During her tenure at the FCC, Rosenworcel, whose term is set to expire at the end of this year, earned the respect of Democrats and Republicans alike, which is why lawmakers from both parties strongly supported her renomination. But despite assurances from Senate Majority Leader Mitch McConnell, Senate Republicans failed to reconfirm her for another term at the agency, despite earlier promises to do so. "Senate inaction and political gamesmanship should never have cost Commissioner Rosenworcel her seat at the FCC," Todd O'Boyle, Program Director for Media and Democracy at Common Cause, a DC-based public interest group, told Motherboard. "She's fought in the trenches to enshrine historic open internet protections, to improve connectivity for schools and libraries, and to close the homework gap for low-income households. The Senate's failure to vote on her reconfirmation represents a stunning loss for the public interest." The battle over Rosenworcel's renomination dragged on for more than a year, and was riven with Capitol Hill intrigue. Senate Republicans had initially promised to reconfirm her in exchange for Democratic approval of Republican FCC Commissioner Mike O'Rielly. But last summer, Republicans backed away from that pledge, because, they said, FCC Chairman Wheeler refused to clearly state his willingness to step down under a Republican presidency, as is customary under a new administration. Republicans held the ambiguity over Wheeler's stance as a bargaining chip over Rosenworcel's head. If Wheeler promised to step down under a Republican presidency, GOP lawmakers said, they would reconfirm her. Wheeler refused to make his intentions clear, effectively giving the GOP an excuse to hold up Rosenworcel's reconfirmation. It was only in recent weeks that Wheeler pledged to resign immediately if it would assure Rosenworcel's reconfirmation. Senate Republicans wrapped up business over the weekend without action on Rosenworcel's renomination, effectively ending the FCC career of a public servant who is widely regarded as one of the most talented and knowledgeable FCC officials to serve at the agency in the last decade. "At the end of the day, this was not Rosenworcel or Wheeler's fault," said a Capitol Hill source with knowledge of the matter who requested anonymity because they were not authorized to speak publicly. "This was a case study about the obstructionism that's been the hallmark of Senate Republicans during this last Congress. Republicans promised to reconfirm Rosenworcel, and they reneged on that promise, again and again." Public interest advocates fear that under Trump's FCC the agency will no longer protect internet openness, promote cable and wireless competition, ensure broadband privacy protections, rein in exploitative prison phone costs, or encourage deployment of internet access around the country, especially in low-income, rural and underserved communities. Wheeler now faces a difficult choice. With Rosenworcel out of the picture, the 70-year-old FCC chairman is now the proverbial "last-man standing" preventing an immediate Republican takeover of his agency. As FCC chairman, Wheeler is obliged to step down from that role in January, to allow President-elect Trump to select a new leader of the agency. But Wheeler's term as a regular FCC commissioner does not expire until 2018. In other words, he can stay on, and along with his Democratic FCC colleague Mignon Clyburn, fight to preserve the pro-consumer legacy that he has built over the last three years. 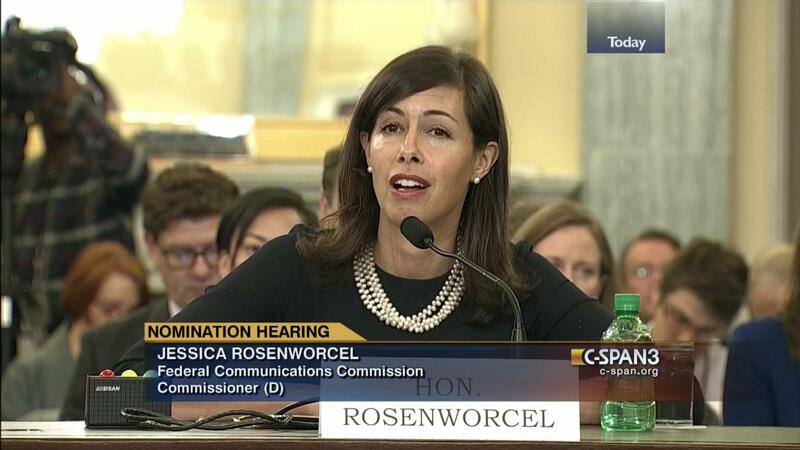 Commissioner Rosenworcel did not return a request for comment, nor did a FCC spokesperson.